I’ve come to regard myself as being like Winnie-the-Pooh “a bear of little brain”. I like to give myself a task, settle down to it and get on with it without distractions. Sometimes the task itself can be quite complicated though. In recent posts I’ve shared a view of “Strategic” and “Tactical” plans with you. I know you haven’t seen what is inside them but I find having them enormously useful. That brings me to the next level down: the day to day, dynamic To-Do list. Having a dynamic list of the tasks I have to do is enormously useful. If I’m managing other people doing things, then I need to know what they are doing too. This is what the classic project plan is all about. Even a small team needs a shared plan. I used to create them using spreadsheets but now I use a special purpose tool. The picture above shows screenshots from today’s dashboard. The tool I use is PBWorks Project Hub (http://www.pbworks.com/). I use the “Freemium” version, and I find it adequate for my needs. It does most of the things I would have been doing with a spreadsheet and it does some other things too. It is very good at doing the boring Project Office things like bugging people (including me) when they are due to be doing something today. It is also good for collecting reports of progress made or problems encountered. All that has to happen is that people have to get into the habit of making one-line notes on the task they are working on each day. I have a geographically dispersed team. The two of us exchange notes and have the occasional phone call, but the project dashboard gives us something that we can go back to for status information without a lot of cumbersome bureaucracy (which would usually devolve to me!). The only downside of this approach is that we are using a cloud service which requires internet connectivity and could be vulnerable. That means that I take what I think are appropriate steps to have the critical information stored in some other form elsewhere. Wheels within wheels, plans within plans, but we do need action! A week ago I shared the front page of the strategic plan for my business with you. Plans are all very well but what we really need is action, but of course we need controlled action which is moving us towards the objective. With this in mind, I created what I’ve described as a “Tactical Plan” which I’m going to share with you. The tactical plan sets out an objective and some projects I am going to be working on for the first 3 months of 2015. I’ve included a redacted plan below. I first heard the word “redacted” in association with US Government documents. I think I would probably use the word “censored” instead. By-the way the Russian word for “editor” is “redactor” (редактор). I’m not sure if that is one of the little tricks laguages play on us, or whether it tells me anything about the Russian attitude to editing. That really is all there is to the Tactical Plan. It is pinned to the wall in my office and it reminds me what I am achieving at the moment. It helps me to focus and keeps me from getting distracted. Of course, there are more detailed plans as well. As you can see from the redacted plan, I have an objective, an end date and three projects. The three projects are addressing areas which I know need work: Product and Marketing are hardy perennials and in this case I felt it was time to do a bit of spring-cleaning in the thing I use for the detailed plans and tracking. I may show you that some time in the future. 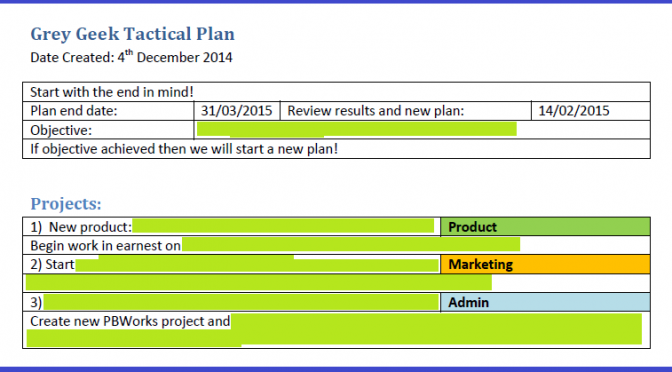 Author Tom GilliesPosted on 2015-01-05 2015-11-13 Categories 2015, January, PBWorks, Project Management, WinterLeave a comment on Wheels within wheels, plans within plans, but we do need action! A little earlier this week I attended a Webinar on PBWorks ProjectHub product. I have used PB Works’ wiki product for years (anyone who remembers me from LCCH may remember me setting up a reference site which was based on PBWiki). 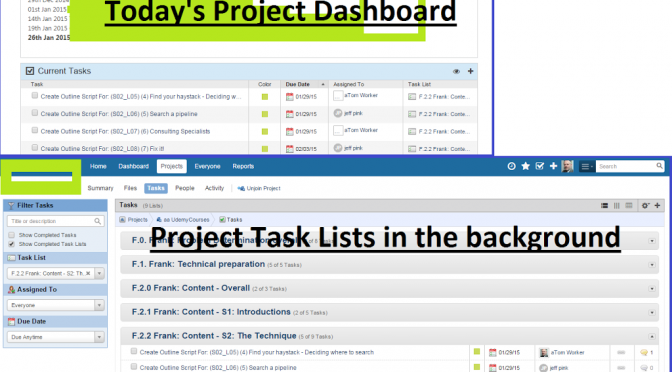 Right now, I’m using the “Freemium” version of ProjectHub to manage a small project I’m running. The project team is split across two countries (Ireland and Wales), so the opportunities of meeting face to face are limited, but thankfully we’re all in the same timezone and all speak more-or-less the same language! I’ve used various bits of collaboration software on various different platforms for years now. Sometimes it works well for the project, sometimes it works less well. 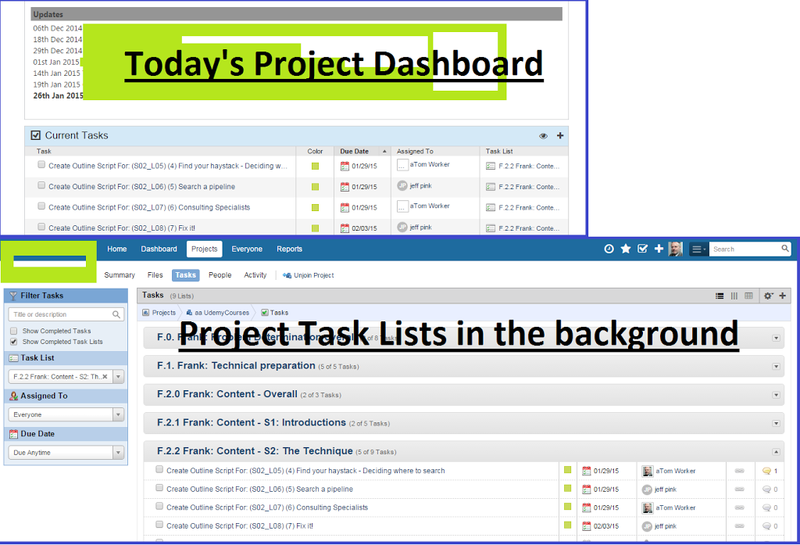 With ProjectHub, I like the way that I can switch between a top-level view, to a short term “what is the next focus” view, to an individual task view quickly. what our individual responsibilities are. In order to keep things running smoothly, we have a role which I call “the badger”. The badger’s job is to spot when people have forgotten to complete updates (usually because they’ve been doing something more important and more interesting) and remind them. The good thing about something like ProjectHub is that the actual effort of adding a couple of line comment on a task, or ticking the “complete box” is easier than arguing, so things remain reasonably up to date. The badger doesn’t have to be the PM (right now it is me though), in fact, it’s better if it is someone else, because even the PM needs to be badgered sometimes!